We Aussies just can’t pass up a good puff pastry or pie, it’s basically our go-to for a cheeky indulgent lunch at a cafe, bakery or convenience store. For some, it holds so much nostalgia, as a lot of us grew up on party pies and sausage rolls, lunch at a small cafe with the grandparents, and stopping in on a small town for lunch during a road trip. The sad truth is though, that most of those types of delicious pastries aren’t vegan and the ones from convenience stores or frozen in supermarkets are loaded with preservatives. So I decided to make my own vegan take on a classic vegetable turnover for old times sake… and it turned out to be deeeelish! 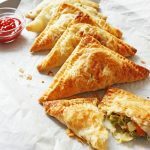 This recipe is made up of only 7 ingredients that you likely already have on hand: puff pastry, onion, carrot, peas, flour, water, and vegetable stock powder. It’s so simple to make! It starts with frying up those veggies, reducing the heat to mix in the flour and veggie stock, adding the water and simmering. 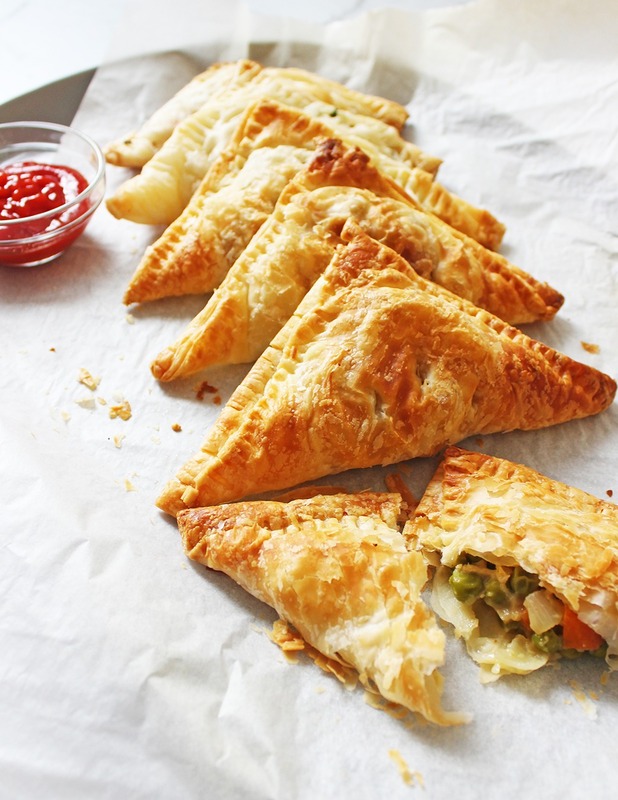 Next, we assemble our turnovers all pretty like and then pop them in the oven for 20 minutes. Ta-da! Preheat your oven to 200 degrees C (390 F), line a baking tray and set your pastry out to defrost while you prepare your filling. Dice your onion and carrot while heating a small amount of oil in a frying pan on medium heat. Fry the onion, carrot and peas in the frying pan until soft and then turn the heat to low. Add the flour and veggie stock powder, stirring to coat the veggies, then immediately add the water and mix until the flour is dissolved into a creamy sauce. You may need to add a little more flour or water to get your desired consistency, continuing to stir. 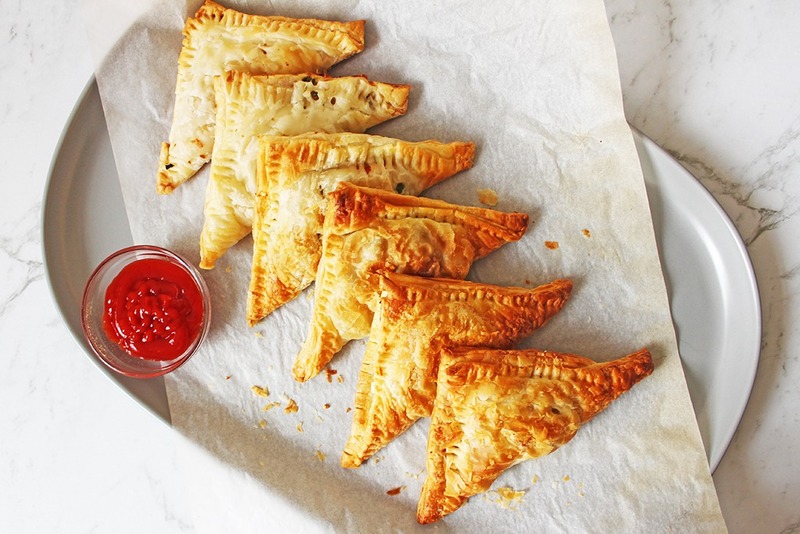 Slice each pastry sheet into four equal squares. 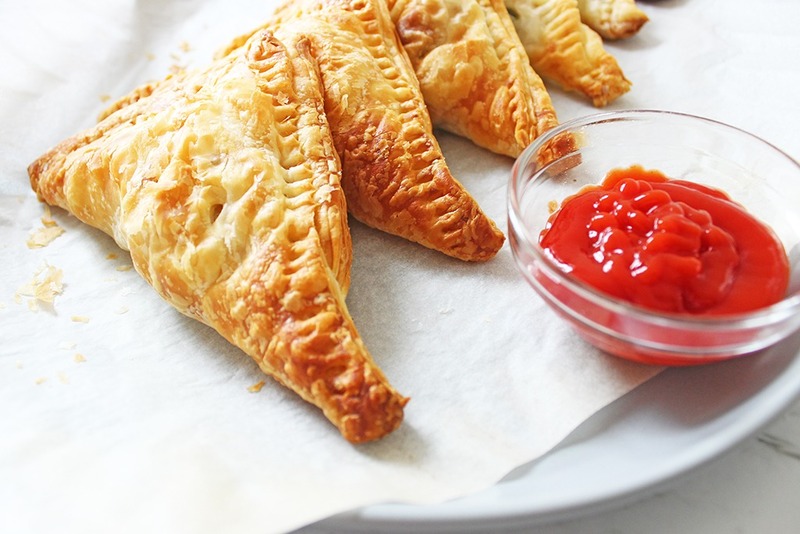 On a lined baking tray lay out your pastry squares, pop roughly 1.5 tablespoons of filling into the centre and fold over the pastry into a triangle, use a fork to seal the edges and then use a sharp knife to stab 3 small lines into the top of each pasty so that steam can escape while they’re cooking. Cook for 20 minutes or until golden and crispy. Let them sit to cool and enjoy! *I use a vegan pastry by Australian brand Pampas but you can find more on PETA's Accidentally Vegan list.